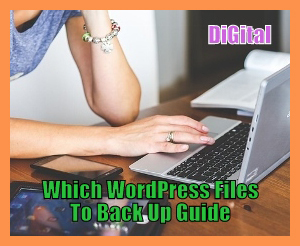 Many of you are still confused as to which WordPress files should back up for safe keeping. In fact I have already written a post about WordPress backup. Yet, some of you still asked me, precisely which WordPress to back up. This is a clearly-explained guide to help you once and for all. Your WordPress site is made up of Files and Database. When you install WordPress, you are installing a collection of files and that is what they call "WordPress core". The WordPress core files make up the appearance and functionality of your WordPress site. These files can be seen in the root folder, wp-includes and wp-admin folder. You normally would never make any changes to these files, so they remain the same on all WordPress sites. You just back up these files once and you don’t always need to backup these files. You can always get fresh copies of these files from WordPress.org website. Basically anything you upload to your WordPress site gets store up here. It includes your themes, plugins, uploaded files, and images. If you know what plugins and theme you had installed on your WordPress site, then you can always get fresh copies of these plugins and themes from their sources. In that case, you don’t need to backup plugins and themes folders. If you have a customized theme (means you made changes to its original design), then you definitely need to back up these folders. As all your images are in /wp-content/uploads folder, and if you lose this folder, then you will not get them back for good. So, always back up this folder. Without this configuration file, your WordPress website will not function. It contains your connection details. The wp-config.php file is generated during the installation process. It stores your database information. Without this information, your WordPress website will not work, and you will get the ‘error establishing database connection‘ error. WordPress stores all the data in a MySQL database. This is where all your posts, pages, users, comments, categories, links and everything else is stored. If your database gets deleted or corrupted, you will lose everything you have written. This is the most frequently updated part of your WordPress site. In other words, you must back up database more frequently. So these are the four WordPress files which you must back up, so you can use it to restore your WordPress site.